Review: There are some books I read and can go on with my daily life. Then, there are books that make me want to stop everything I'm doing and not go anywhere until I've read every single last page. This book was definitely the latter and I fell absolutely, head-over-heels in love with it. Katy has just moved to West Virginia the summer before her senior year. She's not really sure how things will turn out in her knew town, until she meets her new neighbors. Dee is super sweet and it looks like they could be really good friends, but Dee's twin brother Daemon is a whole other story. He may be gorgeous at first sight, but his arrogant, cocky attitude is a HUGE turn off. Pretty soon, though, Katy realizes that's not the only thing wrong with him. There's something strange going on with them, and more than once things have been happening around Katy and Daemon that she just can't explain. Who exactly are her new neighbors and why does Daemon have to be so gosh darn irresistible? This book was just...wow. Completely and totally awesome. I'm really annoyed with the people who compare this to twilight. Yes, they are both about a girl who meets a guy who happens to be something not human. That's about all they have in common. Katy is SUCH a more likable character than Bella and vampires and aliens are two very different things. Not to mention Katy and Daemon have so much more chemistry. Seriously, this book had me so frustrated with all of their chemistry and Daemon using that chemistry to play with Katy (frustrated in a good way, though!). I LOVED their relationship and how Jennifer Armentrout was able to create such a strong vibe that even the reader could feel it and beg for them to get together already. Not only is the romance awesome, but so is the action! Daemon pulls out his bad boy side and kills their enemies with no hesitation. And Katy even pulls out some ninja moves and kills some bad guys of her own. Like I said, the characters are just so awesome in this book. Dee is pretty awesome, along with Katy's two human friends. I kind of wish we got to know more about Andrew, Adam, and some of the other aliens, but I understand that this was Daemon and Dee's story, not theirs.Oh my gosh, and Katy's a book blogger! I was so excited when I figured out that part of her character because I can totally relate to her! It makes me believe a gorgeous alien could move in next door to me...haha just kidding! I am so in love with this book and if there weren't more books in this series, I have no idea what I would do. Thankfully, Jennifer Armentrout is absolutely amazing and has published more in this series! I have the next one waiting on my Nook just dying to be read. So I'm going to figure out what happens between Daemon and Katy while I REALLY encourage each and every one of you to pick up a copy of Opal now! Trust me, you have to read this book! Now! Great review! 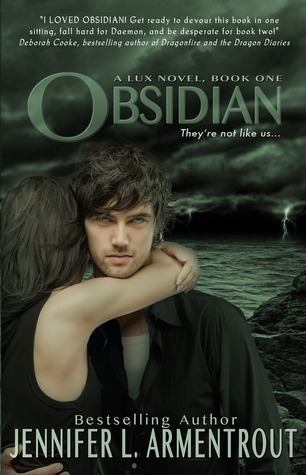 I loved Obsidian, and Katy being a book blogger made it so much more relatable. Daemon was simply swoon-worthy, it doesn't get better than that, and Opal's ending was cruel. I can't wait to read Origin! I love this series! It is annoying when so many books are compared to Twilight and they're nothing like it. I enjoyed this book as well and did not really see any similarities to twilight! I can't wait to read Onyx I've had it on my e-reader since it came out but I haven't had time to get to it! I'm glad you really liked it! I liked the first two okay, but I did have some issues with the characters. I felt their back and forth of loving and hating was a bit annoying. But I love the whole alien thing and all that. And I just picked up the third book today. I think that I will love it because I've heard that the issues I had before are gone. Hope you continue to love the series!